High school science students can create chemical content projects. Gone are the days when your child could slap some paint on a Styrofoam ball and make a simple science project featuring the Earth or the moon. High school sophomores today have the academic skills to create higher-level science projects that feature in-depth looks at specific subjects. Whether your 10th-grade student is tackling earth sciences, the physical world, chemistry or bio basics, science fair topics that include a combination of class content, research and creative flare offer the chance for hands-on learning. High school earth science should contain content on the Earth's systems, history of the Earth, weather and climate, human sustainability and space systems, according to the Next Generation Science Standards. Sophomores can focus on sustainability in the face of change in a specific area of the planet. This type of project can help your sophomore to better understand the importance of an ecologically friendly outlook. 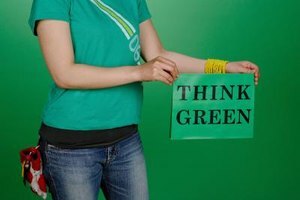 The educational website Science-fair-Guide.com suggests that 10th-grade students try projects such as studying air purification, looking at the annual variations of the ecology of a specific body of water or looking at biodegradability. For example, your student can fill a clear plastic terrarium with regular garden soil to compare what items biodegrade and what don't. He can add an orange peel, shreds of paper and a plastic bottle cap to the soil. This project requires time for your student to make observations and take notes before he can draw a conclusion. 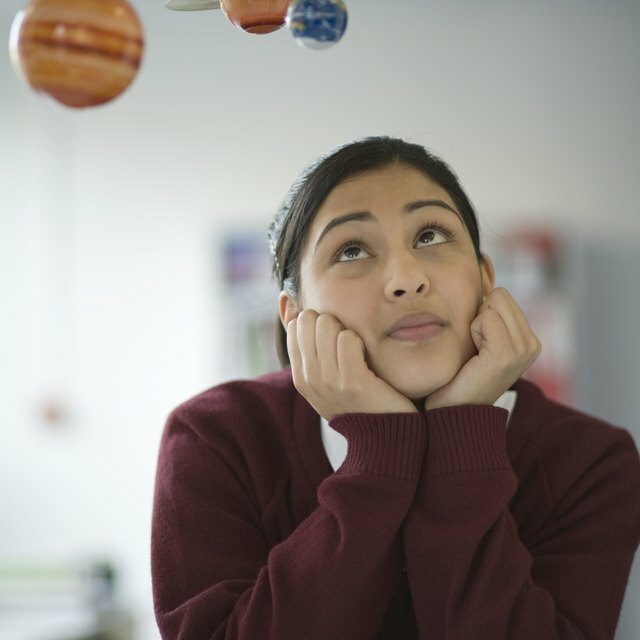 If your 10th-grade student has an interest in outer space, a stellar science project can focus her attention in the area. Your science student can conduct an in-depth study of the lunar surface, reading past research, studying maps and looking at photographs. Additionally, the student can get hands-on and observe the moon though a telescope to make nightly recordings. Before the science fair, she can put together her presentation, including all of the facts, copies of photos and her own observational recordings. Have her focus on a specific aspect of the moon, such as the geography of the lunar surface or lunar images from past to present. Chemistry is much more than the periodic table that's hanging in the front of your sophomore's chem class. Your 10th-grade student can create a chemistry experiment to display at the school's science fair that features chromatography, enzymes as catalysts or simple reactions. Avoid anything that is potentially hazardous, could cause harmful vapors or possibly explode during the experimentation project or the fair itself. One high school-worthy topic is studying how salt and sugar affect the freezing point of water. 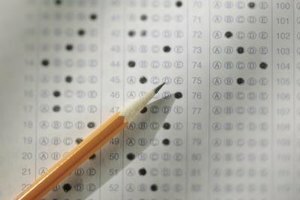 According to AllScienceFairProjects.com, your teen can test different salt and sugar solutions -- using varying amounts mixed with water -- and test how long each takes to freeze in an ice bath. Your student can record the time it takes for each solution to freeze, noting what percentage of the salt or sugar was in the water. Have your teen translate the results into something practical, coming up with applications for the use of chemistry to help public works crews reduce snow or ice on freezing roads. Your 10th-grade student can create a biology science fair project that features either plant or animal life. Coax him to go beyond the juvenile plant or insect life-cycle project, and pick something more in-depth. The Science-Fair-Guide.com website suggests topics such as factors affecting how bacteria grows, studying behaviors in mice or comparing artificial light and sun light on plant growth. 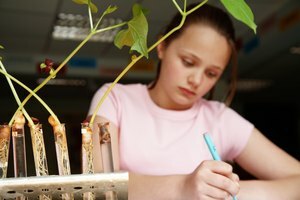 For example, your 10th-grade student can set up two identical plants -- with one in full sunlight and the other under an artificial grow lamp. She can record the growth, keeping all other factors -- such as the amount of water she provides -- constant. She can document the growth with notes as well as photos of the plants. After a few weeks or months your student can create comparisons and a conclusion as to which one works better. Loop, Erica. "Science Fair Project Topics for 10th Graders." Synonym, https://classroom.synonym.com/science-fair-project-topics-10th-graders-33297.html. 26 September 2017.